This year was a very special Christmas for our family. 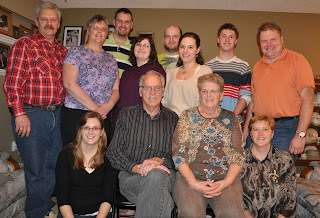 All 12 of the members of my family were able to celebrate together on Christmas Day! We did have to wait for two members of my family to get off work before we could eat our turkey dinner, but the important thing was that we were all able to be together. To commemorate this occasion, we took a picture. Well, actually, we took several pictures! It took some time to get all 12 people to be looking the same way, not be talking, etc. We were a bit challenged because of limited space in our living room, but we managed to get a decent picture in the end. Pictured, standing in the back row, left to right: my husband, myself, my son, my son’s finance, my daughter’s fiance, my daughter, my nephew, and my brother. Sitting in the front row, left to right: my niece, my dad, my mom, and my sister-in-law. Years ago, (I am not sure how many exactly, let’s just say many years ago) my mom and I were at a local quilt show. My mom spotted a table runner that she just loved. She purchased the kit and I brought it home. I pieced the top right away and then the project sat on the shelf….for years. While going through some things in my studio before Christmas, I came across the unfinished table runner. I decided I would finally quilt the runner and then surprise my mother with the finished product in her stocking at Christmas. My mom was surprised when she opened up the runner–truth be told, it has been so long since she purchased the runner, she likely forgot that it existed! This entry was posted in christmas, table runner, ufo finish by Norma Hanson. Bookmark the permalink. What a good picture of all of you! It can be challenging to get a group that large and not get someone with their eyes closed, mouth open, talking, looking anywhere but at the camera, LOL. No wonder you had to take more than one! You probably broke it down to just your folks with the grands and one with your folks with you and your spouses too—while you were at it. and I love the runner! Maybe your poppies should be on the list as a quick finish project for 2012. Red is good for Valentines!